Okay, I need to stop for a minute because I have to tell you some exciting news! Once a Month Meals featured my blog as Blog Partner Spotlight today (see story here)!!! 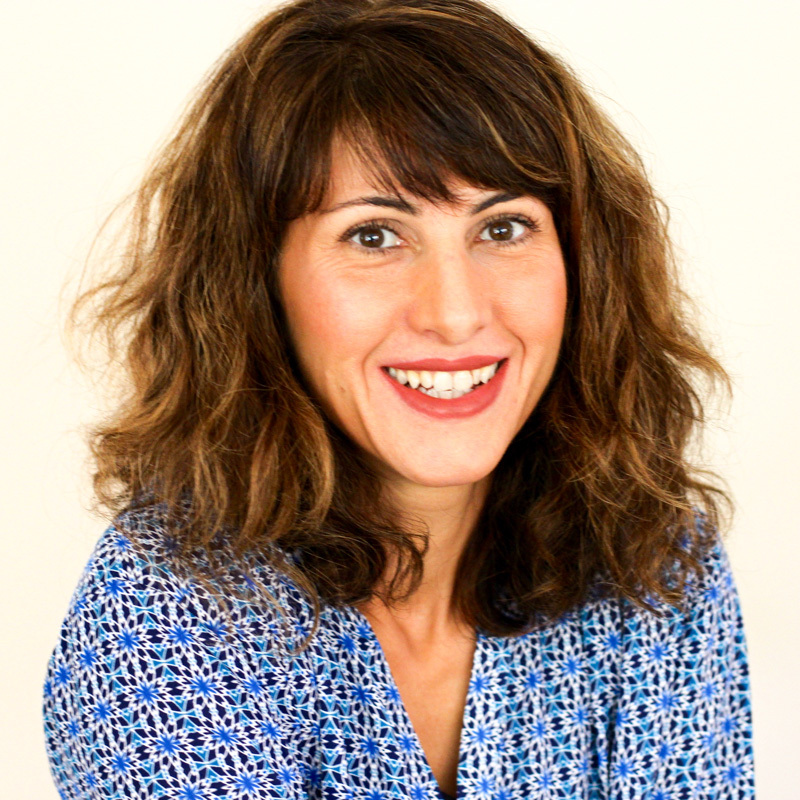 As a food blogger sharing my recipes that come from a restricted dietary lifestyle that I try to make fun, and delicious for my family, it warms my heart for Once a Month Meals to share my story, recipes, and answers to questions about my kitchen. They are a terrific blog with so much valuable make ahead information and recipes on making easy monthly freezer meals, whatever the dietary lifestyle may be. I encourage you to visit – see their site here. I am so happy to be a part of their community! When the food centric holiday of Thanksgiving comes around so do the bundt pans. 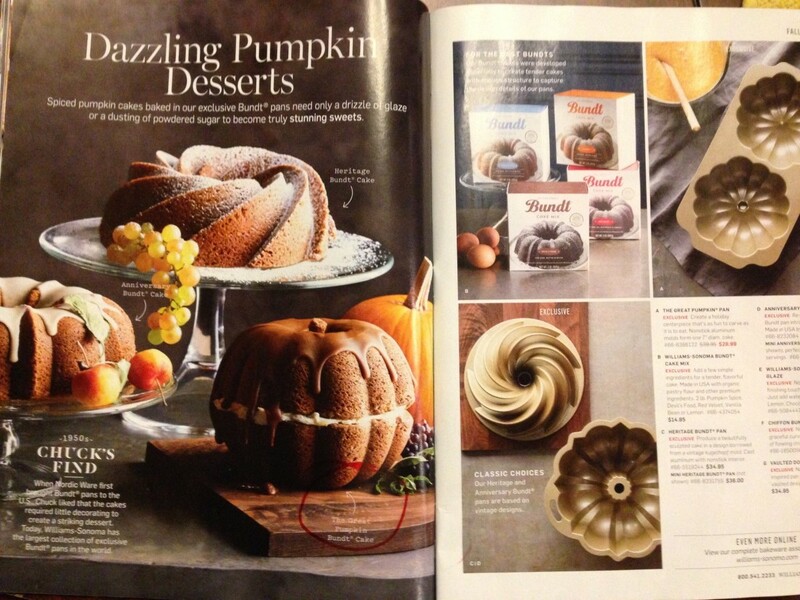 What is fall, and the holidays, without some sort of bundt cake? When I saw the cakes in the catalog I immediately thought “ooh I need to make this”. I wanted a bite of that Spiced Pumpkin Cake on page 48! The warm caramel hue, and anything pumpkin makes me do crazy things, like bake lots of bundt cakes, including one classic large bundt to test a new recipe I conjured up from one of my existing recipes. I prepared this a few times this week to ensure consistent results after I happily got my great pumpkin pan. Okay, it was also the pumpkin pan that suckered me in. I couldn’t resist. All that cake? Not to worry, nothing in a family of six goes to waste … and I have a big freezer. After running off to the mall after my farmer’s market stop (in the parking lot of the mall, how convenient right?) 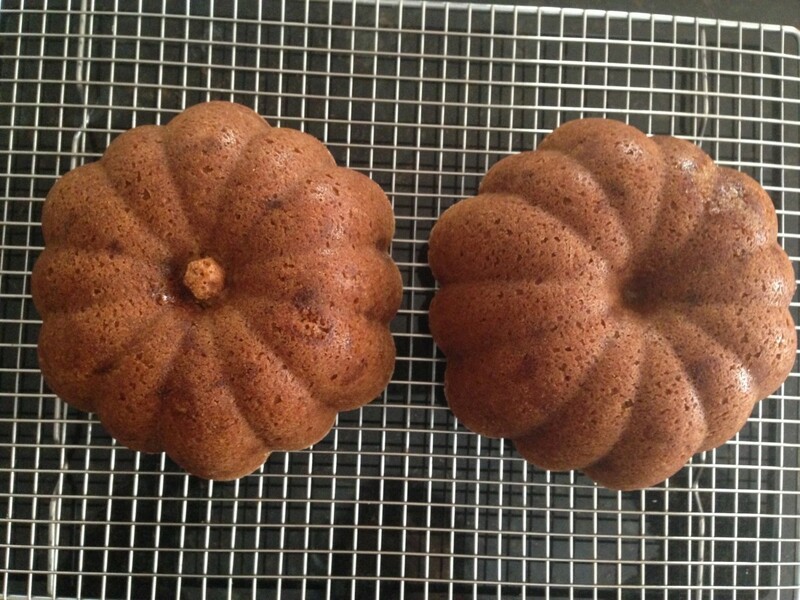 and getting that cute pumpkin cake pan to make one just like the one in the catalog I got baking. When it came time to make my orange glaze I didn’t realize I ran out of red while standing there with mixed powdered sugar! Though it was supposed to be orange, and didn’t come out the color I intended it to, it still gave the feeling of fall in it’s shape along with the light drizzle of maple syrup I added at the last minute. 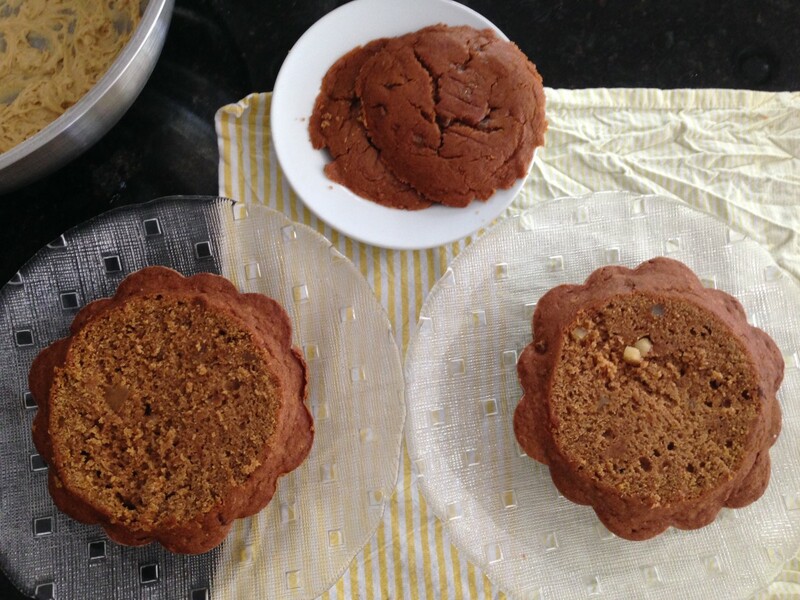 I don’t know what comments my big family will make when they see my golden pumpkin cakes, but I can guess what they will say when they eat it … no one will remember anything about the color when finish their desserts. 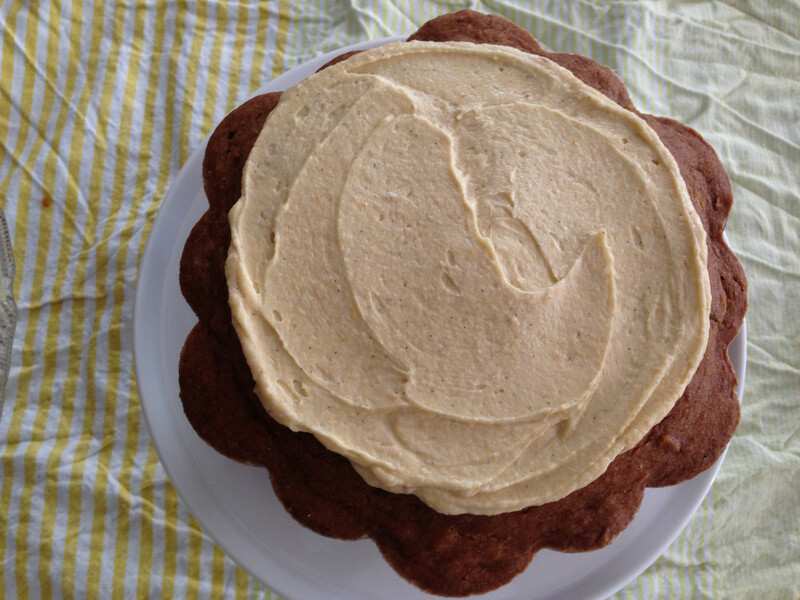 I tweaked my pumpkin spice cupcake recipe – see here for recipe – for this cake. I know, I know it is funny that I adapt a recipe from myself. BUT, that recipe is so foolproof and delicious every time, so why not. Tis the season for egg nog, so I added some in here — stuff I can drink all day long. I also decided to add crystallized ginger to the recipe that I thought would go well with the warming spices. A nice surprise in every bite. As it baked the whole house filled with pumpkin spice, along with the sweet smell of gingerbread lingering in the air. It’s holiday time. After all is said and done, cooled, set, glazed, with photos complete I begin wrapping my glazed pumpkin cakes to store in the freezer until Wednesday (intending to freeze all the cakes since mommy, that’s me, made oatmeal cookies yesterday). Then out of the corner of my eye I see my youngest son grab the plate of the sliced piece (in the photo) and run into the den. While I stand there with a pumpkin bundt and plastic wrap in my hand. Well, I couldn’t freeze the bundt with a slice missing. So we ate it. And ate it well. Licking our lips and nearly our plates. The moist, tender crumb, full-of-pumpkin-spice will fool even the most clever taste preceptors that this is gluten, dairy, and soy free. And egg free if you choose. My large bundt we had today is also egg free, vegan. Can you see those bits of ginger? I must tell you the glaze is pretty, festive, and really tasty, but sometimes a simple sift of powdered sugar is all you need when a cake has it all. This cake is a showstopper on it’s own, we all thought. I will let you be the judge of that. So, that’s it. 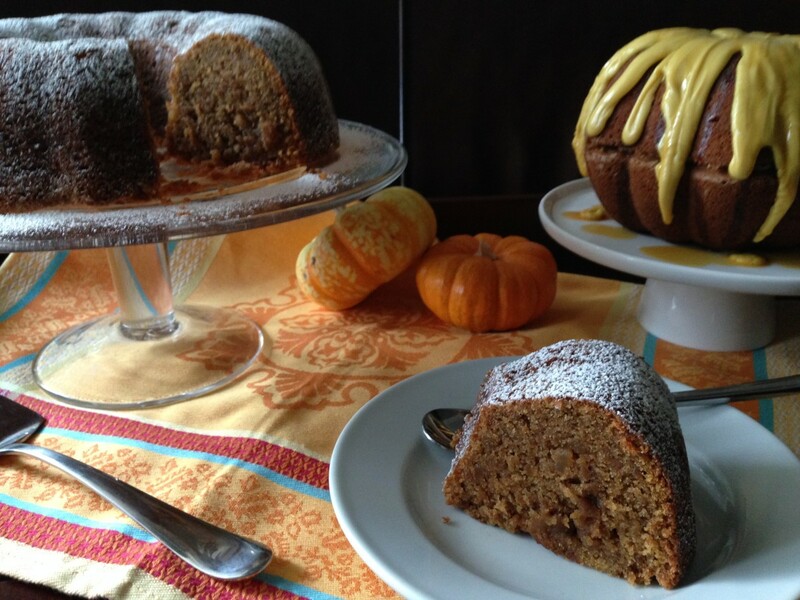 The final Thanksgiving adapted recipe inspired from the beautiful, and tasty looking savory and sweet foods in the catalog in the classic large bundt and, my new addition, the great pumpkin bundt pan to choose from. But I’m not done just yet. No. This catalog is a big one. I have more up my sleeve with Chanukah, and Christmas — foods I have had my eye on. Stay tuned. P.S. – Though not inspired from the catalog, more like off the top of my head, I will soon post a cranberry “butter” that’s perfect with warm cornbread of GF/DF/SF dinner rolls. And so easy! 3 whole eggs, room temperature OR one large banana for an egg free, vegan option. Position a rack in the lower third of an oven and preheat to 325°F. Generously grease and flour using powder sugar the wells of the great pumpkin cake pan (sold exclusively at Williams Sonoma), tap out excess powdered sugar. Note: A few pinches at a time then shake and spread throughout the pan and tap out excess. Repeat as needed. I find powdered sugar to be foolproof, especially on pans like this with many wells. I used about an 1/8 of a cup of powdered sugar. 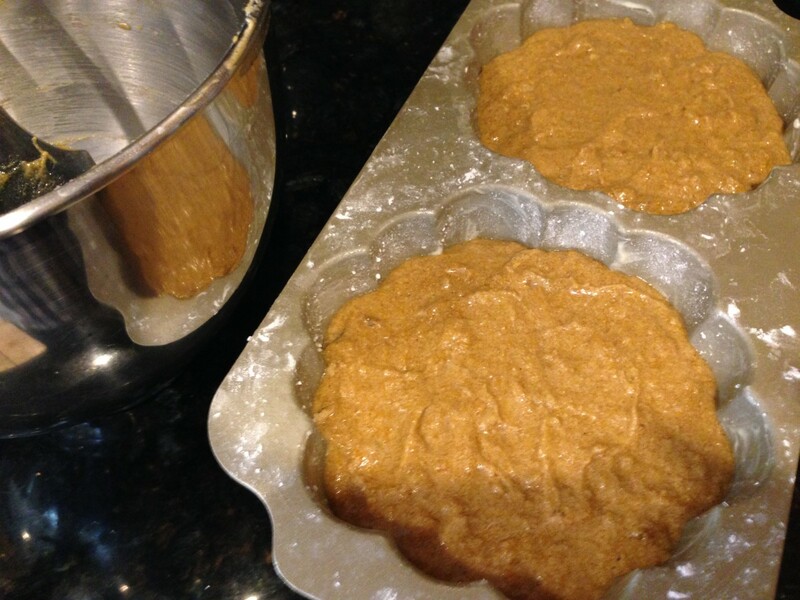 In a large bowl, combine flours, baking powder, baking soda, salt, cinnamon, ginger, nutmeg, allspice and cloves. Set aside. 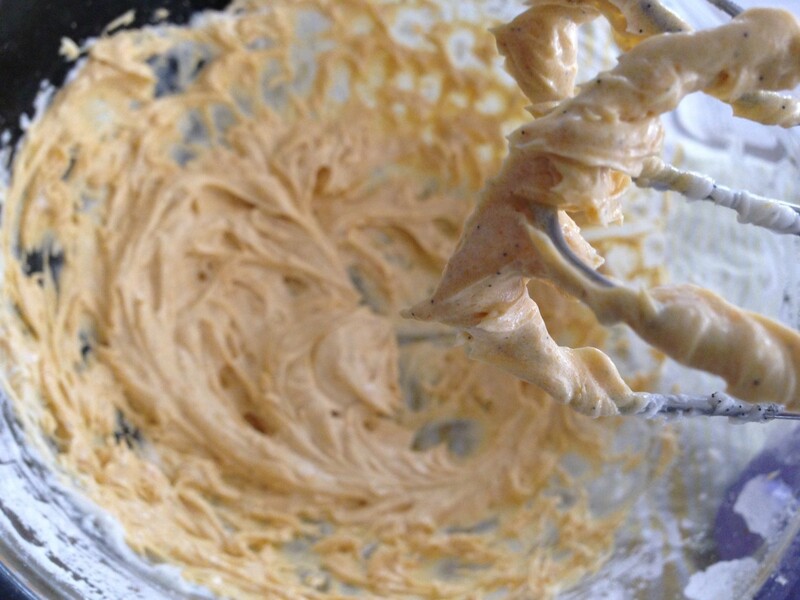 In the bowl of an electric mixer fitted with the flat paddle attachment, beat the butter on medium speed until creamy and smooth, 2-3 minutes. Add the brown and granulated sugars and beat until light and fluffy, about 3 more minutes, stop the mixer halfway to scrape down the sides of the bowl. Add the eggs one at a time, beating well after each addition. Add the pumpkin puree and beat until incorporated. Reduce the speed to low and add the flour mixture in three additions, alternating with the egg nog milk and beginning and ending with the flour mixture. Beat each addition until just blended. 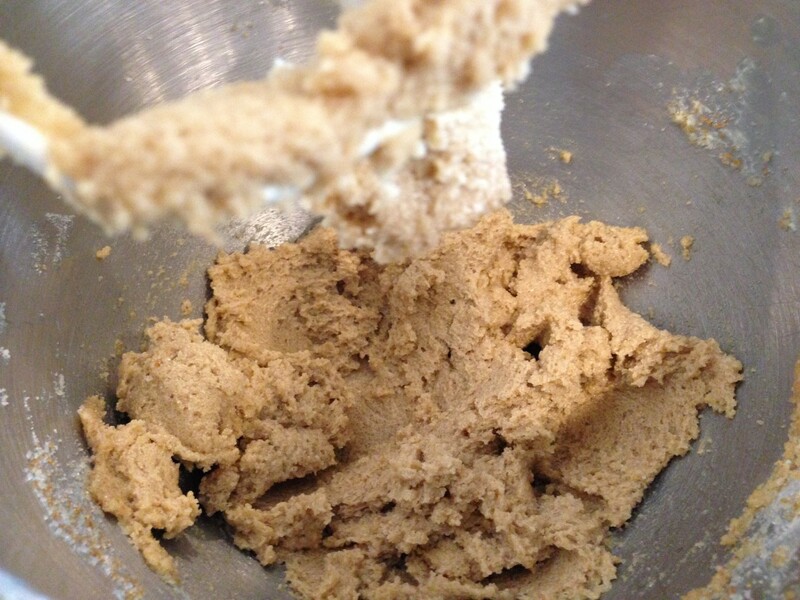 Add crystallized ginger and mix another few seconds to incorporate into the batter. 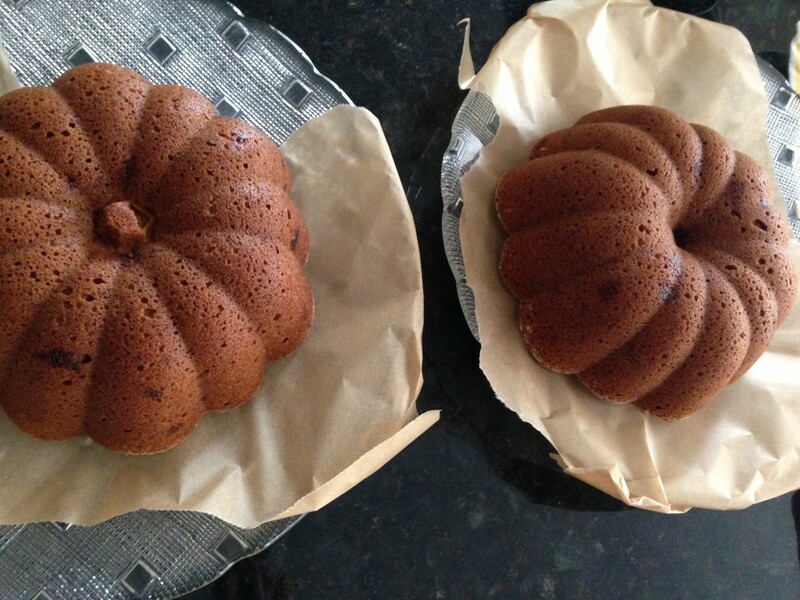 Divide the batter between the two wells of the prepared pumpkin pan and spread evenly or into one large bundt pan. The large bundt pan had about 1 1/2 inches of clearance from the top of the pan like the pumpkin bundt pan. With EGG: Bake 1 hour and 15 minutes. EGG FREE: Bake 1 hour 22 minutes. 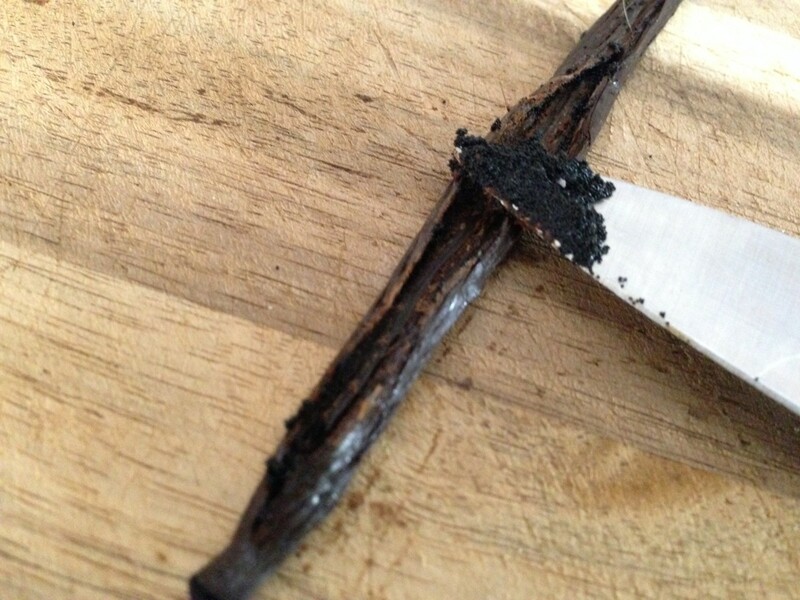 Or until a toothpick inserted near the center of a cake comes out clean. Transfer the pan to a wire rack and let the cake halves cool upright in the pan for 20-30 minutes. Note: The cakes with the egg had center mounds that I sliced off to even the cakes. Note: The egg free one without the banana did not, and needed 7 more minutes baking time. Note: A good indication that your cakes will separate from the pan easily is when they have separated from the wells when done baking and even more so after 20 minutes of cooling. See the edges here, how they pull away? In this picture I just took them out of the oven. Put your cooling rack directly over the cooled upright cake still in the pan. 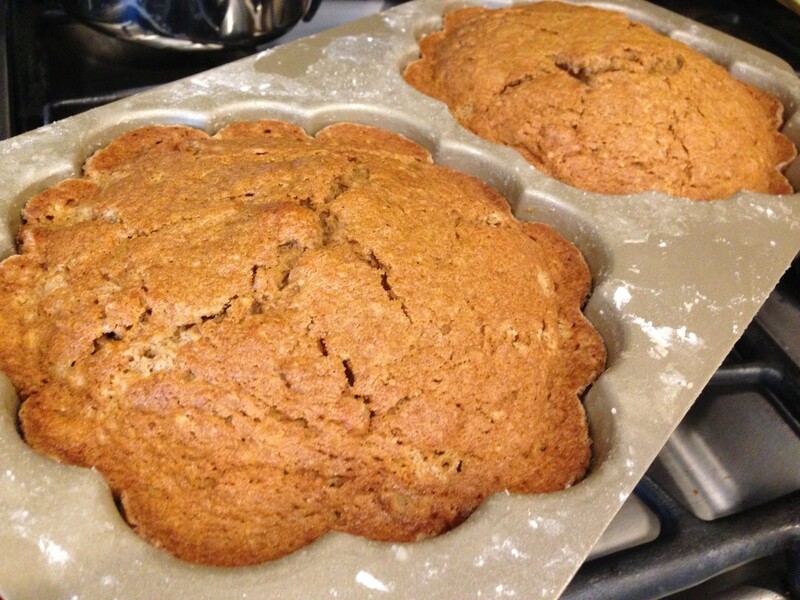 Then while holding the cake pan pressed onto your cooling rack, quickly turn it over so they sit decorative side up. Gently tap the pan, sitting on the cooling rack, to loosen the cake halves. Let the cake halves cool completely. Prepare a baking sheet or two plates lined with parchment paper. Transfer each cake to the paper. 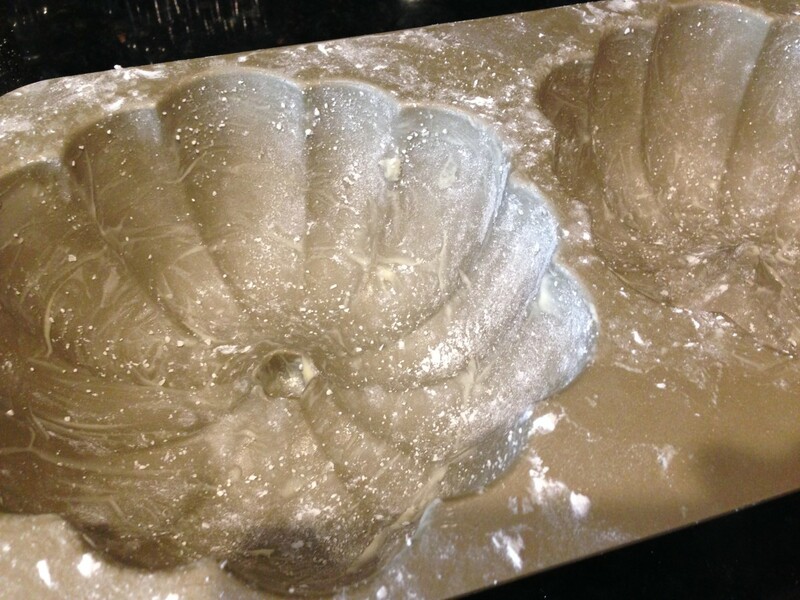 Put a small piece of parchment over the top, and wrap a single layer of plastic wrap. Freeze for 2 hours. 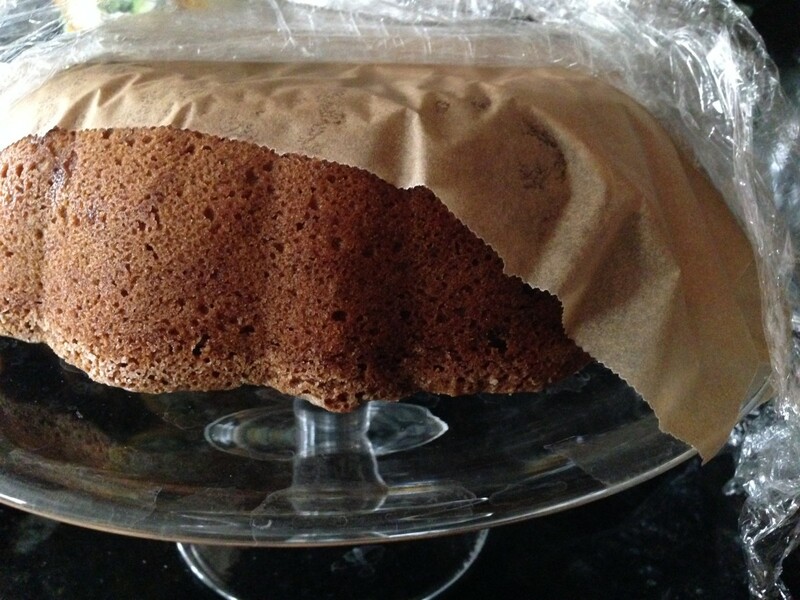 Remove plastic and paper, turn over cakes. Cut off the mounds (if making the version with egg). I did not get mounds on the vegan version. Using a hand held mixer first set on low mix and shortening and vanilla bean seeds, raise to medium speed to fully incorporate and whip the shortening. Add pumpkin puree, coconut nectar, and food coloring. Continue to mix until blended well. In a large bowl sift powdered sugar. 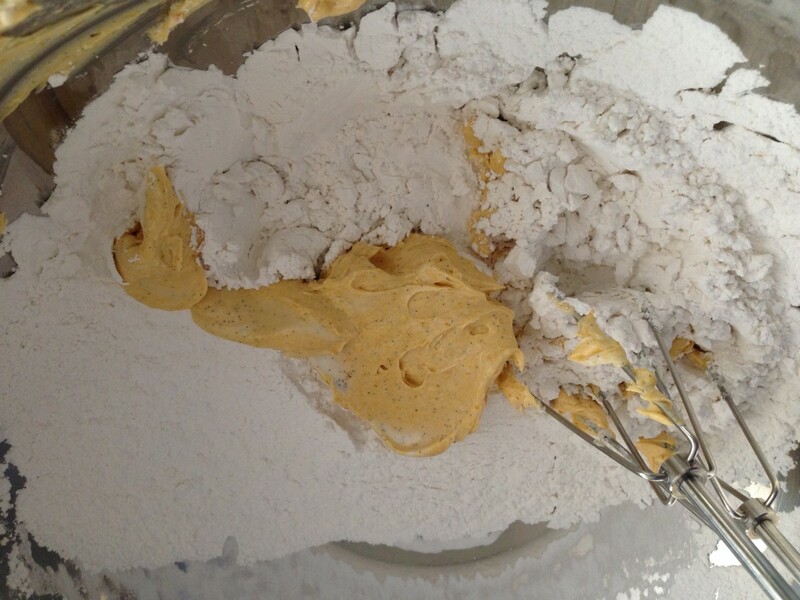 Transfer the shortening mixture into the powdered sugar bowl, mix until well blended. Frost the flattened bottom half of the pumpkin. Place the top piece on top. This will yield for a thick frosting as pictured in the catalog. Frost as thick as you like. I opted for a thinner frosting inside, and thicker glaze on the outside. Those those vanilla bean specks. In a very large bowl (powdered sugar gets messy when dry) add sifted powdered sugar, add hot water, stir well until a thick paste forms. Add coconut sugar and food coloring, stir well. Glaze should be very thick, and not pour easily. Add the glaze with heaps onto a spoon and let it drip for a minute then start from the top and let it fall off the spoon for your desired look. I just let thick sections drip off the sides. Make them as thick or thin as your creative side takes you. If you prefer a thinner glaze add a teaspoon of hot water as a time until desired thinness. 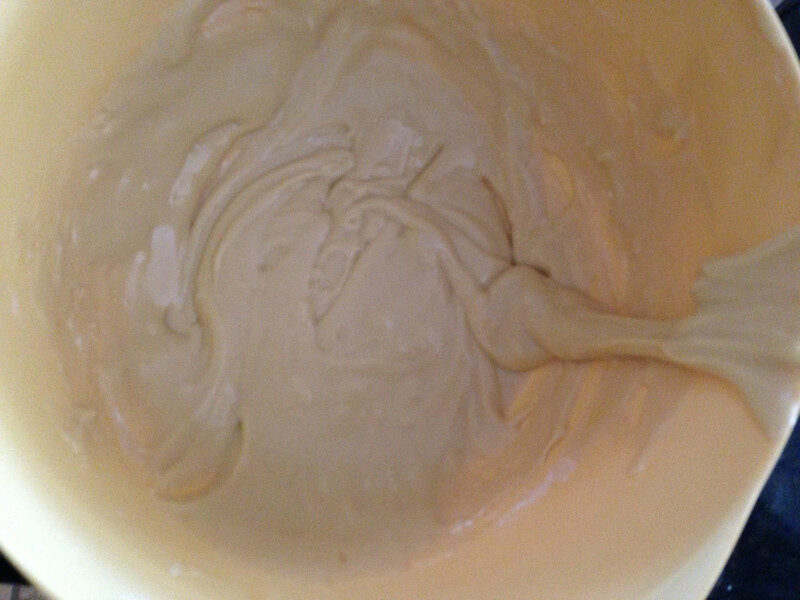 This is how thick my sugar water paste was before adding coconut sugar and food coloring. This cake freezes well. With or without the glaze in an airtight freezer safe container. Note: Prepare the glaze the day of serving if freezing without the glaze. I have not tested the glaze frozen in a container. Note: I froze my pumpkin cake with the glaze placed on a small freezer safe plate by leaving it uncovered in the freezer for an hour. Remove from freezer, then cover with the piece of parchment from earlier, wrap (once) with plastic wrap and transfer into a gallon size freezer bag. Freeze again for up to a month. Note: When I removed my glazed pumpkin cakes (made two) out of the freezer for proper storing the glaze remained shiny and would leave a small indent when I pressed into the glaze. Be careful not to press into the glaze when wrapping and storing for the freezer. Your cakes look divine! I do see the ginger, and love love it! The yellow glaze looks pretty on the spice colors. Orange may have looked too Halloween. The pumpkin cake came out perfect, wow! What a nice idea as a centerpiece dessert for our Thanksgiving. How much earth balance would you say you needed for greasing the pan? I used about a tablespoon for each pan (that includes both wells on the pumpkin pan). It needs lots of grease to make sure there are no sticks, and powdered sugar, a very important part of preparing the pans. Enjoy! We love anything pumpkin and want to make something other than pumpkin pie, this looks exactly what I think my guests would devour. For the egg free version I was wondering when do you add the egg? Thanks Jessica! This cake looks so moist and yummy. I can almost smell the fragrant spices from your description. Just added the ingredients to my shopping list. This is going to be on my Thanksgiving table. Thanks Jessica! That slice looks like heaven on a plate. I need to pull out my bundt pan and get baking now!!! Jessica, If I bake this tomorrow do you think it will stay fresh for Thanksgiving? Thanks! If you will not be freezing ahead, then I would bake it the day before and keep it in a covered cake dome to maintain freshness. Enjoy! 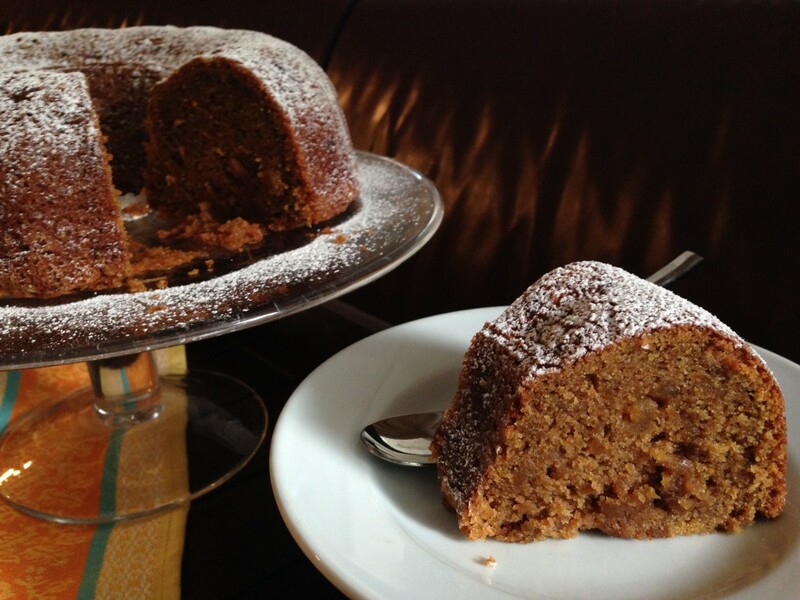 Just to be clear Jessica, this recipe is good for 1 pumpkin pan or 1 large bundt pan, yes? Thanks! I cannot wait to try this. 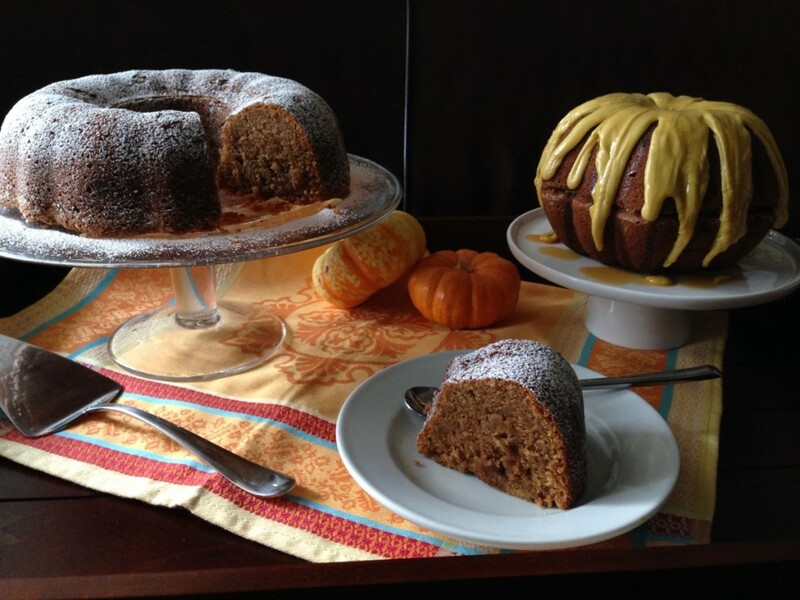 The recipe is good for either the pumpkin pan or the large bundt. Enjoy! Thank you for another amazing, and detailed recipe. On behalf of me and my family thank you for the incredible recipes and am SO happy for your feature as Blogger Spotlight! Whoa those are stunning cakes Jessica! Why am I not in the kitchen now? Yay for being featured as Blog Partner Spotlight! You deserve it babe! Thanks Megan for the sweet words! Thank you Sam C. for the kind words! I would prepare the frosting and glaze days ahead, make the cake the day before and assemble the day before or day of. 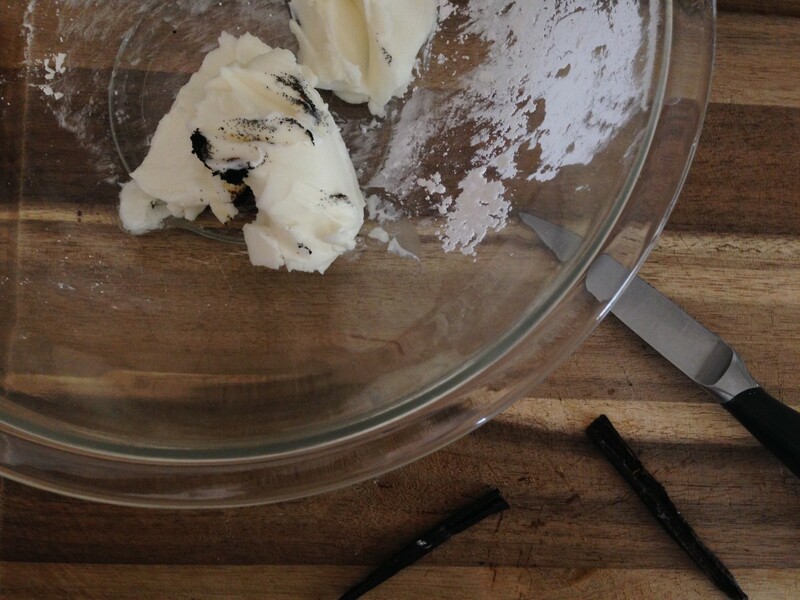 Leave at room temperature in a cake dome to keep fresh. Enjoy! Congrats on the lovely feature on Once a Month Meals! 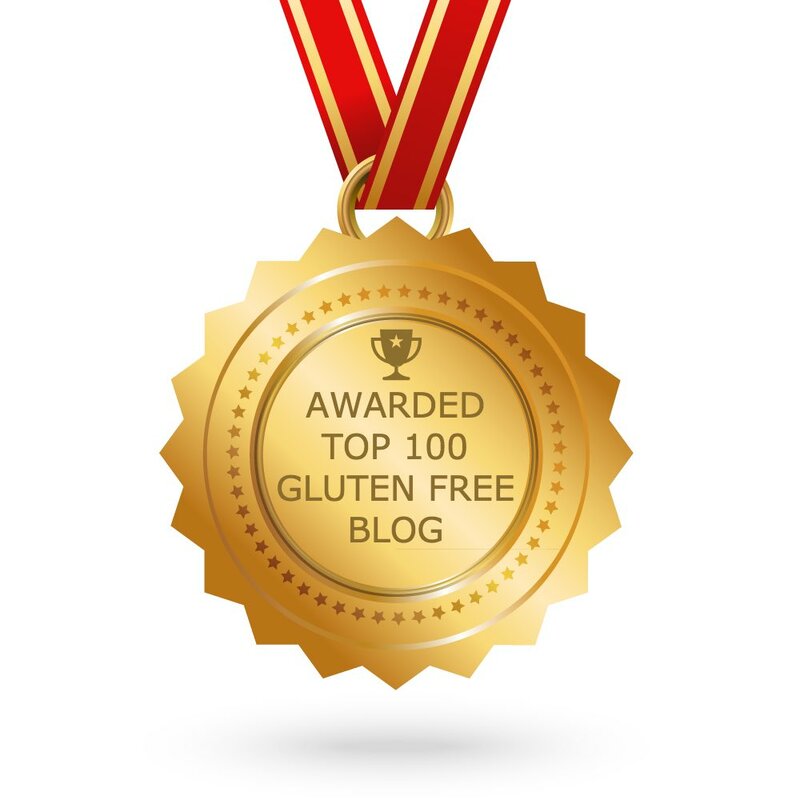 With all the incredible gluten and dairy free recipes you offer it's no surprise! The ginger in here just speaks to me and so does that pumpkin cake. I saw that at Williams Sonoma but didn't know what to do with since their gf cake mix is not dairy free. You have given me good reason!! Thanks Meredith, you are so sweet! It's a pretty cake to make, enjoy! Unfortunately, fresh ginger will not work well in this recipe. I read your blog feature on Once a Month Meals! It was nice to get to know you better in that interview and the common bond over an obsession with pumpkin! 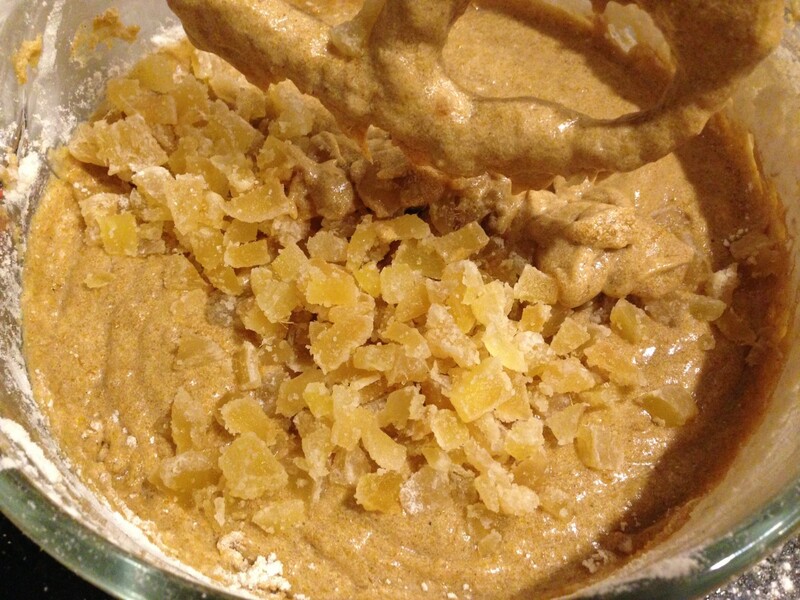 :) I don't think I have ever used crystallized ginger before in cakes. Is it spicy like fresh ginger? Thank you Tina! 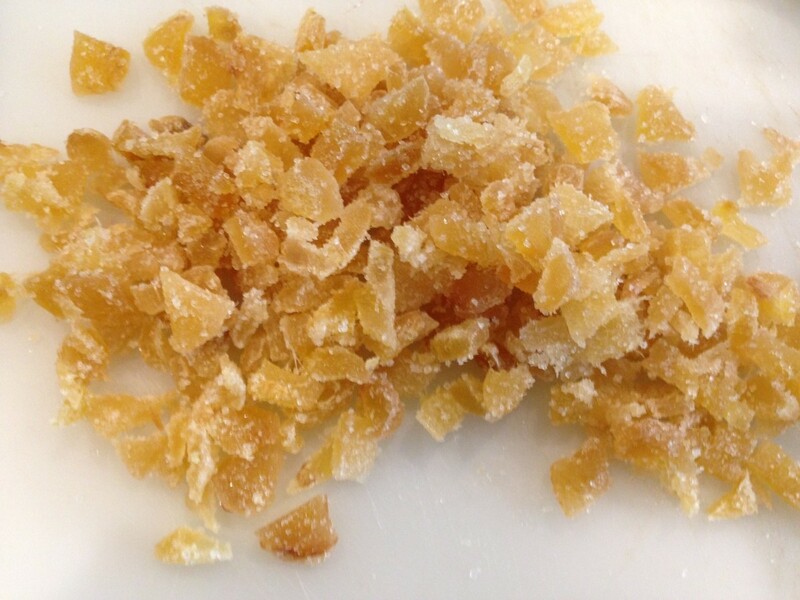 No, crystallized ginger is cooked down in syrup then coated in sugar. It's a soft, sweet ginger dehydrated while still having some heat to it. Fresh ginger is too wet and very strong in flavor, which could overpower the mild taste of pumpkin. wow I want to make this!! How did you get it to look so moist? I've been keeping up with your Williams Sonoma project since your first post and it seems to never let up in terms of deliciousness and amazingness. This cake DOES look so moist. Something I'd be dancing to while making from the first to last step just to see that beautiful bundt come out of my oven. This looks amazing Jessica, I love pumpkin spice and I can't wait to make it! Oops, not egg I meant when you add the banana? Can you tell I wish I could use eggs. Miss eggs. Zoe, for the banana just add when I noted to add the eggs and mix just until blended. We were egg free for a long time a while back and I also wished I could use eggs. Now we found out my oldest cannot have eggs so I need to cut it out of recipes when he is joining us :) Enjoy! Looking at that photo all I can think about is cozying up on the sofa with a big slice of that cake, a cup of tea and wrapped up in a blanket watching Seinfeld reruns. Thank you Evelyn! A good knife is key to prevent any injuries that a dull knife can cause and it makes prep in the kitchen go quicker and smoother. It really speeds things up in the kitchen. If you only buy one good one, make it a utility knife, which is versatile and not too big. Went out and bought all the ingredients needed for this. Fully equipped. Will make today. For Thursday. Wish me luck! Thank you for this recipe. lovely dessert I will make tomorrow :) my 12 year old is newly diagnosed celiac so this came to the rescue thanks! It was love at first bite! This cake encompasses the taste of the fall holidays. Thank you Jessica! Get out! This is flawless! My bundt cake smells so fragrant. I made it today just in case the recipe didn't work out (never know with new gluten dairy free recipes.) I cannot wait to serve this tomorrow. Thank you for sharing your recipe.